The Eco‐Absorb® Emergency Spill Kit is a portable spill response solution designed to quickly react to small to moderate size spills. 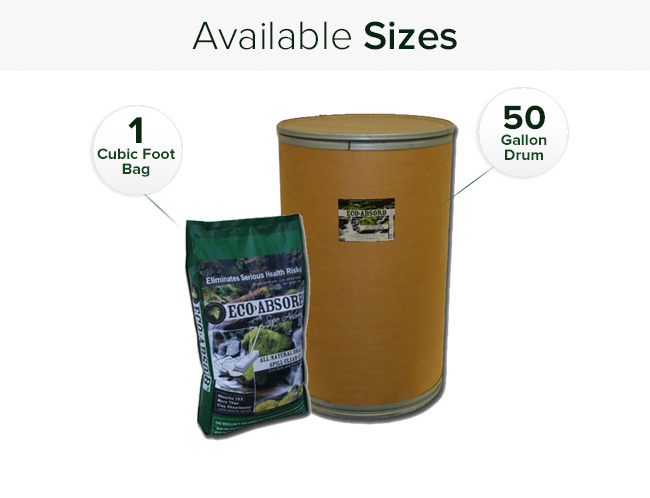 The Eco‐friendly absorbent is ideal for oil, transmission fluid, gasoline, diesel fuel, hydraulic fluid, antifreeze, hazardous materials and all liquid spills. Equipped with our Emergency Spill Kit, you can contain and completely absorb any accidental spill quickly and easily with no hazardous residue left behind. 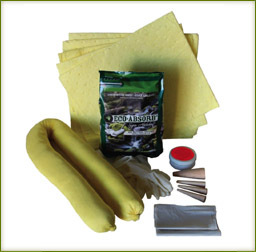 The Eco‐Absorb® Emergency Spill Kit is a portable spill response solution kit designed to quickly resolve a spill as large as 6 gallons. This convenient and effective emergency rolling response kit is handy and sturdy with durable wheels making it a breeze to roll to a spill site. 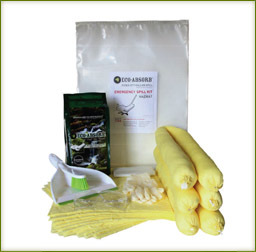 Eco>Absorb Emergency Rolling Response Kit is far more effective & less expensive than clay absorbents. Specially formulated to be permanently dust ‐free, this formula will remain dust‐free even after the package is left open. This formula is ideal for all spills in all environments. Perfect for sensitive environments. Instantly Absorbs up to 15X more than Clay – With no Residue! Made from Natural Renewed By-Products. 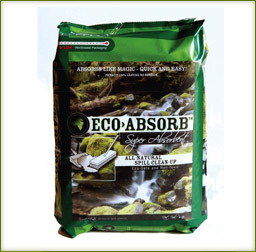 Eco>Absorb Super Absorbent is far more effective & less expensive than clay absorbents. Ideal for responding to small to moderate size spills, any professional vehicle will benefit from having Eco>Absorb® onboard. The kit includes everything you need to quickly and effectively deal with unexpected spills. Don’t be caught with a spill without having one of these onboard. Contains DOT required plugs and putty to temporarily plug fuel tank punctures. 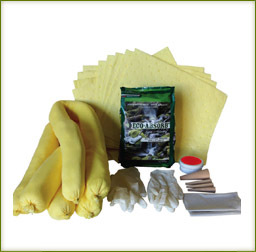 Equipped with our Standard Truck Kit, you can contain and completely absorb any accidental spill quickly and easily with no hazardous residue left behind and meets DOT requirements. This is a wall‐mountable unit perfect for use in areas prone to spills. 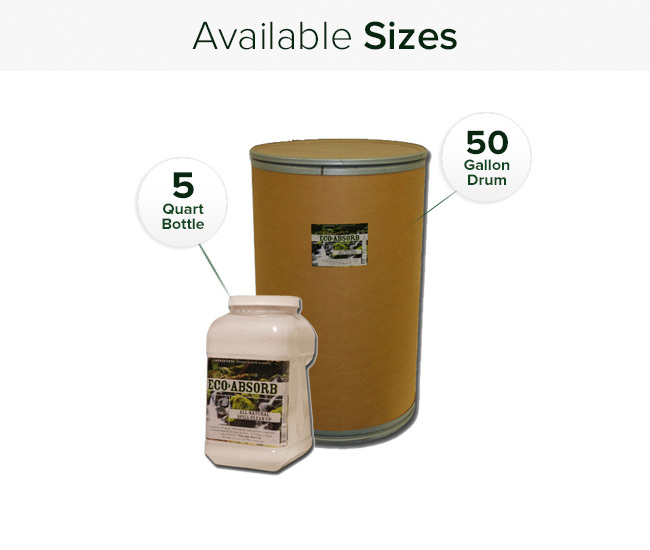 The Spill Center is fantastic for strategic placement throughout a store or warehouse facility. Immediately minimize slip & fall hazards and greatly decrease aisle downtime with this great spill clean‐up system. Absorbents must be purchased separately. 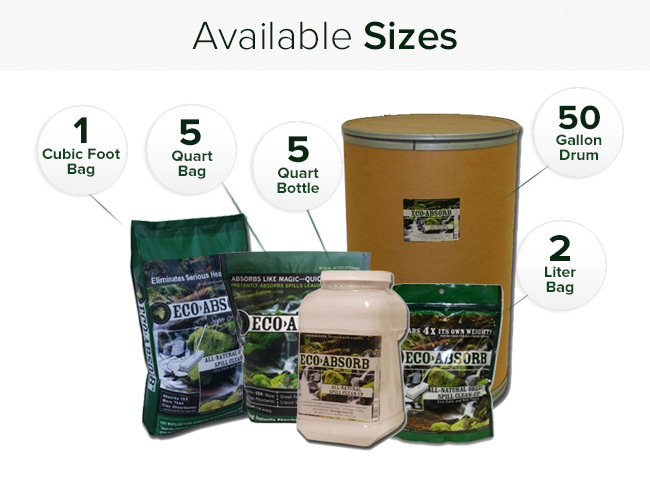 Designed to easily hold our 2 liter, 4qt, & 7qt bags, as well as our 5qt bottles, and our Bio Hazard Kits, our Spill Center’s are an essential piece of any effective spill management program. Specially formulated for use outdoors and in areas prone to air movement, this formula is heavier, helping it stay on the ground when trying to clean up a spill. 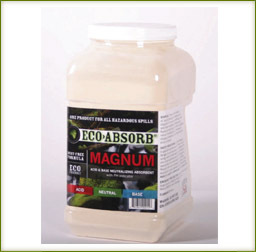 Eco>Absorb® Outdoor Formula is ideal for use on roads, driveways & other outdoor locations. Specially formulated to be completely hydrophobic, this Eco>Absorb® formula will absorb petroleum‐based spills off of the surface of water leaving only clean water behind. This formula is ideal for water treatment facilities and those responding to spills on the surface of water or ice. It can also be added to the surface of ice to control slip / fall conditions. Will not sink! Remains floating on the surface. Absorbs Spills Instantly Saving Time & Money! Eco>Absorb® Oil Only Formula is the ideal absorbent solution for petroleum‐based spills on water. 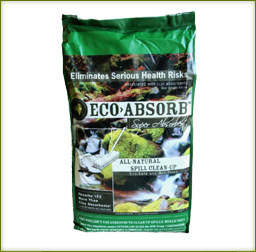 This Eco>Absorb® formula is specially formulated to detect, neutralize and instantly absorb both acids and bases with only one product. Equipped with pH color indicators that clearly identify acids and bases, the product turns a natural beige to indicate neutrality. Turns natural Beige when the spill is neutralized. 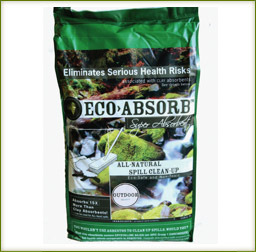 Eco>Absorb® Acid / Base Neutralizer is all you need to neutralize and absorb acid & base chemical spills. For a fleet of transportation vehicles, nothing compares to the spill response capabilities of our Large Truck Kit. 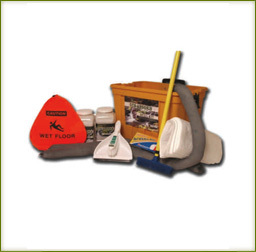 The kit includes everything you need to quickly and effectively deal with unexpected spills. Don’t be caught with a spill without having one of these onboard. Contains DOT required plugs and putty to temporarily plug fuel tank punctures. 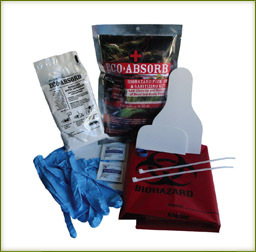 Eco>Absorb®’s Bio Hazard Kit is designed to handle any hazardous spill that you may encounter. The kit contains non‐latex disposable gloves, one biohazard waste bag, Eco>Absorb® bio‐hazardous super absorbent, two plastic scrapers, 2 antimicrobial wipes, and 2 zip codes. Optional mask & goggles. The Bio Hazard Kit is ideal for hospitals, medical offices, emergency response vehicles, and schools. 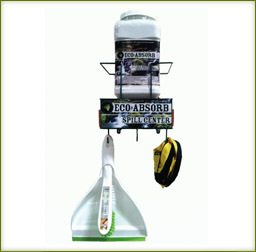 The Eco>Absorb® absorbent contained within the kit fully absorbs any spill, leaving no residue behind. Once absorbed, the spill will not leach back into the environment. The original lightweight super absorbent, this formula is ideal for indoor spills and is a lower cost alternative to our Dust Free Formula. A new‐age‐technology special blend of all‐natural, renewed by‐products, Eco>Absorb® Coconut Formula is a one ‐of‐a‐kind super absorbent. 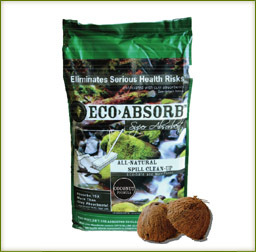 Eco>Absorb® Coconut Formula is made from some of the most absorbent materials available in nature. The combination of coconut pith, a byproduct of the coconut industry, and our all‐natural, totally inert compound, makes Eco>Absorb® Coconut Formula super light weight yet incredibly absorbent.